In Populi Library, a Resource is information about a particular item available in your Library. They cannot be checked out, reserved, transferred, etc. To loan out resources, you need to add copies or digital resources—say, MP3 files to a music resource, or a PDF to an article resource. Copies are the actual, physical artifacts available somewhere on your shelves, whether available for loan, reserve, transit... or not at all. Resources can exist without particular copies (digital assets like photographs, for instance), but copies cannot exist apart from a particular resource. Before you add resources, make sure you've set up your Libraries and Locations first. Your resources need a home! Enter one of the accepted codes (or scan a barcode with such a code) and click Search or hit your Enter key. If Populi Library can locate the code among the the various databases it searches (usually Amazon.com, unless it's disabled), it will produce some basic resource information. After that, you can begin uploading digital resources and entering copies. If you're entering a resource by hand, at minimum you'll need to enter a title. You can also upload an image, select the type, and enter a replacement price. Review the imported resource information. Populi sometimes needs a few minutes to crunch through large MARC files; once it's done, it will email you a link to the review screen. Select a location to which you'll import these resources. Check/uncheck resources you'd like to import. When you're ready, click Import Records. 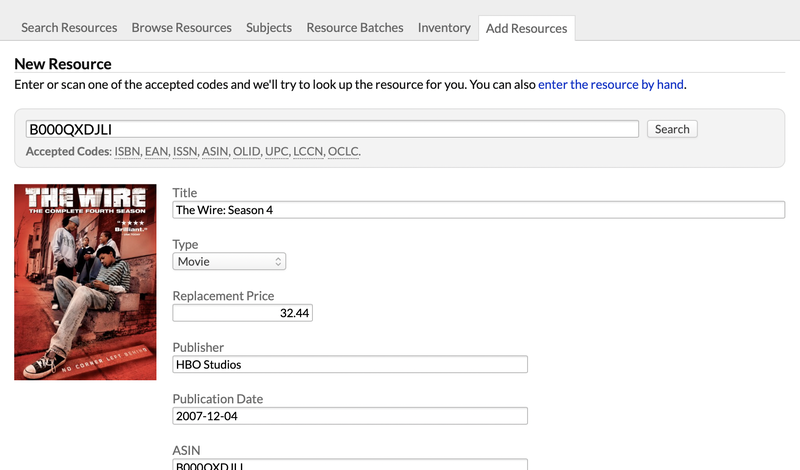 After the records are imported, you can begin adding resource copies on each item's resource page. Once you've created the resource, you can add copies, information fields, and modify existing information fields by hovering over them and clicking edit. Images: Hover over the resource image and click Edit. Choose a file from your computer (Populi accepts image files with the .jpg or .png extension) and Save. Your patrons can view/play and download the files. Your patrons can download a .ZIP file of all of the files. Re-order the files: click Edit next to Digital resources available and drag the files into the order you'd prefer. Your students and other users at your school can recommend this resource, read and post reviews, and place holds. Go to the resource page. Under the digital resources and any existing copies, click Add a copy. Enter the Call #, scan/enter the Barcode, and enter a Purchase Price. If barcode auto-generation is enabled (check Library Settings), Populi will auto-fill the barcode field with the next available barcodes. If this resource was imported from a MaRC record, some of this information may already be filled in. Next, select the Home Library, Location, and Status. Speed: Scanning an item takes a second; typing and searching might get tedious—especially with a pile of Resources to take care of. Accuracy: Scanning an item keeps keystroke errors from slowing you down (or causing problems later on). Populi works with USB keyboard emulator scanners. Your computer regards such devices as a keyboard; their inputs are entered into Populi just like a fast, accurate typist was sitting at the keyboard. There are numerous makes and models starting around $40 apiece. For what it's worth, we use a Unitech MS180 barcode scanner for our internal testing purposes. If you can't find this exact model, there are many similar entry-level devices you could use instead. This might be an obvious question, but how do you delete a copy or remove a resource? Also, how do you change the book's picture? Those are fine questions. We need to add image upload/editing to resources. We're also looking into the best way to handle resource/copy deletion and/or retiring. Those are on our list of things to do. I came here with that question as well. Another one I have: How do you change the status of a copy? If something that was available becomes unavailable? There's no way to do that currently. But that sounds like something we should let you do. I'll let our developers know! I agree with Katherine (and Brendan) there needs to be a way to change a resource from available to unavailable and back again. Is there a feature in Populi that lets us print out spine and pocket labels? @Elizabeth—Not yet, but that's definitely something we want to add. EDIT: We added label generation. Is is possible to link an existing labeling system to Populi records? @Pat—No, we haven't built anything like that; we will be devoting our energies to our own Labeling features. Is it possible to merge resources? If two resources are identical and are accidentally added as separate resources instead of additional copies, can they be merged or do we have to delete one and add a copy to the other?